High end brands often have to deal with the issue of counterfeit products. Mainly made in China, these replicas are sometimes done in such a way that, unless you have a genuine product on your hands to compare them to, it’s extremely hard to tell. With brands that are held in high regard and come with price tags that not everyone can easily afford, the risk of having counterfeit products of their genuine ones increases exponentially. We have previously looked at a couple of renowned brands and learned more about what things to look out for in order to be able to tell whether the jacket you are looking to purchase, or have already purchased, is a genuine one or not. 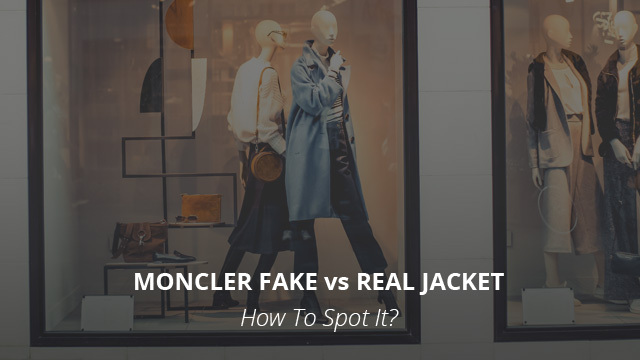 Today we will be going through some of the telltale signs of a counterfeit Moncler jacket. Moncler is a brand that is held in high regard for its stylish jackets, especially those made with down insulation. Their designs are very well made and often measured against those by Canada Goose. Earlier this year we wrote a comparison piece on the matter of which of these two brands is the better one. You can find it here. Now let’s get started with today’s topic on being able to safely purchase a Moncler jacket that is indeed made by the brand itself. 1. Why “Moncler” Jackets are Worth Their Price? 2. How To Spot a Genuine Moncler Jacket? Moncler was founded in 1952, in France. However, due to it later being purchased by Remo Ruffini, an Italian entrepreneur, the brand is now regarded as an Italian one. This is a luxury brand, which focuses on designing eye-catching jackets that are worthy of being on runways. Made of the highest quality of Japanese nylon, their jackets are able to provide some weather protection, but truly shine when it comes to providing insulation. White goose down is their insulator of choice and the Coyote fur trim that can be found on the hoods of their designs are all factors that greatly improve their jackets’ performance and longevity. With a production line that is run in several European countries, in which the highest standards of manufacture are met, it’s no surprise that the resulting jacket is a beautiful piece that will last for many seasons. The North Face Real vs Fake Jacket: How To Spot It? Great, now you know why Moncler is held in high regard and the reasons why it is the target of counterfeit. Let’s now go through the details you should look out for in order to make a safe purchase. We always start with this part as it is the very first step in improving your chances of getting a genuine jacket and not a replica. High-end brands like Moncler do often sell directly from their website, but they also have trusted retailers which are guaranteed to ship out a genuine product. One of those retailers is Nordstrom, which also sells products from many other brands. Another retailer that can be trusted to purchase a genuine Moncler product from is Saks Fifth Avenue. With that out of the way, if you have found a retailer that makes you a bit uncertain, we’d highly advise that you reconsider. But, if you are looking to proceed, then asking for a photo of the actual product that will be shipped and then matching its details to a genuine one is a good first step. Sellers that are non-responding, who have reviews that clearly indicate problems or who sell at a much lower price than the original jacket is worth, are almost guaranteed to be scammers. It’s not uncommon for counterfeit products to have names that are not part of a genuine collection from the brand, or to not even look like any jacket that should be on the brand’s official website. Lookout for these tactics, and also beware of those that advertise such products as being limited edition in order to try and weasel their way out of why the jacket cannot be found on the brand’s website. Tags can be replicated to the finest details, but odds are that there will be something off in a counterfeit one. Size tags, for example, are placed on the left side seam near the collar on a genuine jacket. A jacket that comes with a size tag sewn below the brand label, placed in the middle of the lower part of the logo, is a definite counterfeit. The only case when this is not an indication of a counterfeit product is in reversible jackets. Sometimes, a size tag sewn below and to the left of the brand label is also found in genuine jackets, in older models. In the case of down jackets, also look out for the size indication. A fake product will have the U.S labeling (XL-L-M-S). Moncler does not use such size indications, so look out for that. First and foremost, if the jacket is made for the U.S market, there will be a tag indication the country of manufacture. For those made for Europe that is not the case. Another indication of a counterfeit product is if the country indicated on the tag is France or Italy. Unless you are looking at a jacket from the “Gamme” collection, which is made in Italy, then the product is likely a replica. As we mentioned above, Moncler jackets are made in European countries, which are Moldavia, Romania, Armenia, Bulgaria, Hungary and Georgia (not the U.S). Countries other than that, especially China or Vietnam are an indication of a fake jacket. The size of labels has also changed from 2010, from a wider tag with large letters to a slimmer one with small lettering. The way the tag is sewn is also a thing to look out for, as it should be folded and both ends sewn together to the jacket, not only one side. There are several other tags present on the jacket, such as those that include the DIST certification, as well as the Industries tags. In these you should mainly look for incorrect spelling and also irregular or messy printing or embroidering. The letters should be crisp and clear, well-made and easily readable. Moncler offers a tool on their site that checks the code that is printed on the label in order to verify that the jacket is genuine. Depending on the result, you might want to contact customer service in the case of a counterfeit product. The fabric of the jacket, as we said before, will most likely be Japanese nylon. It is a highly durable fabric, it looks and feels high quality and does not have a very glossy appearance. There should be no issues with the fabric or stitching, such as stains, tears, threads sticking out or visible seams that are on the verge of coming off. The fabric should be smooth and the jacket should feel comfortable. High end brands also use high quality zippers and toggles on their jackets. The Moncler jacket will come with an “M” and a cockerel engraved on the toggle. The zipper placement should be flawless and the zipper should run smoothly, without catching on the fabric or getting stuck midway. While there are cases that counterfeit jackets might come with same-brand zippers, they will have problems with the logo as the exact replication is difficult to make. To shortly summarize what this guide consists of, always make sure to take the right steps from the very beginning, in order to minimize the risk of getting scammed. Reliable retailers are the first step and then ensuring that photos match the product, the options of returning or getting a refund if something goes wrong are available, and lastly, actual physical details of the jacket will let you know whether the product you received is genuine. Previous Article← What is Nylon (Polyamide) Fabric? How is it Used in Jackets?